The acute onset means a Y-BOCS (Yale Brown Obsessive-Compulsive Scale) score of >20 and or a Chronic Tic Disorder YGTSS (Yale Global Tic Severity Scale) often with multiple tics. See Diagnostics Page. Below is the symptom criteria for PANDAS. Additional symptoms, such as severely restricted food intake, may also occur. PANDAS children may have moderate to dramatic improvement with antibiotics within one week of treatment, however, further interventions may be needed. How to stop the entire syndrome is still debated, but many parents and doctors report prolonged antibiotics (two months to one year) and/or IVIG (intravenous immunoglobulin) treatment or plasmaphoresis. 2005: An excellent study of 202 children by Dr. Loren Mel, et al in 2005 lends credence to the likelihood of PANDAS as a separate etiological entity. 2012: Revised criteria and guidelines for PANDAS was established by the NIMH. Why are doctors reluctant to diagnose? 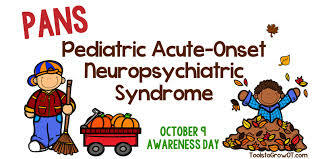 Many doctors assume, if they have heard of PANDAS at all, that it is only the sudden onset of “typical” pediatric Obsessive Compulsive Disorder or Tics. We believe the Case Histories above will help them understand this illness reaches beyond that assumption. PANDAS is currently a clinical diagnosis and open to interpretation and subjective observation. There are currently no conclusive diagnostic blood or neurological tests to be relied on. This is a rare illness. Many doctors have not seen it. Nor have they seen Rheumatic Fever which is a close-cousin to the PANDAS autoimmune syndrome occurring and they don’t appreciate the variability of streptococci and its potential virulence. Is there a PANDAS test? More is written about this in the DIAGNOSTIC TESTS portion of this website. Getting a rapid throat swab and 48-hour strep culture is a good first step. A strep ASO and D-nase Titer test is also beneficial in helping to establish the strep connection. But, many times the titers will be only moderately elevated – and at times not elevated or extremely elevated. This is the variable nature of the strep bacteria. We try to briefly address this in the Strep and Other Bacteria The Medical Controversy portion of the website. It is important to swab all family members to be sure no one is asymptomatic when infected or a possible a strep carrier. Carriers will often not show any strep symptoms, but if tested, will be positive for strep. A carrier will need one or two doses of antibiotics to rid themselves of strep. Throughout the website we try to explain the clinical picture of PANDAS. Children do not become severely mentally changed overnight unless there is an attack of some sort on their Central Nervous System. A series of 5 tests to help determine the “likelihood of the patient’s condition being auto-immune in nature”, including possible PANDAS, is commercially available by Moleculera Labs. This test is derived from the research done by Dr. M. Cunningham. Even though a variety of tests can aid in determining the root cause of symptoms and what course of action may be appropriate, PANDAS IS A CLINICAL DIAGNOSIS. How do I present a clinical picture of PANDAS to my doctor? Please see the Table of FAMILY HISTORY where approximately 20 parents were randomly asked to explain their family medical history. In the interest of time, we did not put all 70+ parents results on this website but in informal conversations these similarities were nearly always found. Bring this table to your doctor if it fits your family’s situation. Most of the PANDAS children in our group have never had an autoimmune workup –testing immunoglobulin (IGg) levels. Of the 15 families that have done so – 10 of the children had various IGg deficiencies that were extreme to moderate. Some of the families also reported that other family members had extreme immune deficiencies. Research has specifically found that mothers have a 25% chance of having an autoimmune disorder themselves (Clinical Psychiatry News 2011). In the DIAGNOSTIC TESTS section there are other suggestions given for tests to be taken that often indicate a child’s “taxed” immune system and scales to help provide a clinical picture of the child’s symptom severity. Are researchers trying to help solve the PANDAS dilemma? Yes. The number of studies involving PANDAS and PANS has grown significantly over the years. Kirvan, et al (2003) Mimicry and Auto-antibody mediated neuronal Signaling Cells in Sydenham Chorea (NOTE: See the Discussion Section regarding Dopamine and CaM Kinase Released into the brain.) And, Kirvan, et al (2006) Antibody-mediated neuronal cell signaling in behavior and movement disorders. (NOTE: See page 3 figure a. – showing elevation of Lysoganglioside, Tubulin and CaM Kinase in PANDAS children at Acute Stages of Exacerbations.) Briefly, it explains that our children are making… an immune response to group A streptococci that causes brain cells to make too much dopamine. It begins in brain cells exposed to the anti-streptococcal immune response. The brain cells make too much CaM kinase and this leads to too much dopamine. Too much CaM kinase was originally discovered in children that have Sydenham Chorea, a movement disorder usually found in Rheumatic Fever that may disappear in 4 to 9 months. The PANDAS children are also making too much CaM kinase. Anti-brain antibodies induced by streptococci react with lysoganglioside and tubulin and cause the increase in CaMkinase and subsequently dopamine release. Thus these anti-brain antibodies may create movement and mood disorders. The current NIMH IVIG study whose goal is to duplicate Dr. Swedo’s earlier work and “test the safety and effectiveness of intravenous immunoglobulin for the treatment of obsessive-compulsive disorder in children with PANDAS”. Enrollment for this study is now closed and we are awaiting publication. Dr. Dritan Agalliu‘s research has the goal to explain the mechanisms that break down the blood-brain barrier in PANDAS. This, in turn, will enable the development of therapies to prevent immune cell or antibody entry into the nervous system, thereby providing long-term treatment for PANDAS. This research is currently underway. Even though PANDAS and PANS research has been increased, funding is still needed to continue this momentum. If you are interested in donating to PANDAS and PANS related research, please refer to our donate section of the website for some suggestions. Those listed are only samples of what is needed. Visit our research section for more information on current studies and articles. Can my child get better? Based on our group of parents that have received treatment – the answer is YES. We have outlined here under the TREATMENT section here what has helped our children. Most families had to stay on daily prophylactic antibiotics to beat back a resistant strain of strep and/or protect the child while they healed from the exacerbation from getting another strep infection. Many of us have found our children have a profound autoimmune response to strep microbially – the children did not get a strep infection but they reacted with PANDAS symptom increase while a friend or family member had strep infection. Many of us have found our children have an immune system that is so heightened that they react to other bacterias or viruses. In these cases, many of us have done IVIG or plasma-exchange as a last resort realizing the antibiotics were not keeping the autoimmune reaction at bay. We have followed a protocol similar to Perlmutter, et al’s (1999), IVIG and Plasma Exhange Study – where 30 children were administered these treatments and had very good outcomes. Read the PROGNOSIS section to understand how the children are continuing in their health. Look at our 200 PANDAS Case Summaries and Survey Results. There are many happy stories. Do NOT give up hope. You must persist and you will get the help you need. What is the Prevalence of PANDAS/PANS? A conservative estimate is 162,000 in the US alone. However, the true prevalence of PANDAS/PANS is not known. PANDAS/PANS is likely as common as illnesses like Pediatric Diabetes and ALS and can seriously affect the healthy outcome of a child’s life, yet funding for PANDAS/PANS is scarce. How do we determine the estimated prevalence of PANDAS/PANS?